The Creative Assembly can be very proud of the work being carried for 15 years with which it is, without doubt, its saga star: Total War. Not only have led to the top of the strategy genre, but have also managed to maintain a high quality delivery. The series has led to battle in many historical periods and in areas as varied, from medieval Japan to classical Rome, and now bring us back to relive the turbulent period when the Huns came to Europe with Roman Empire, divided into two and about to succumb both its internal problems and the threat of barbarian tribes. This time, in addition to fascinating and very appropriate for the theme of the saga, also has the point of interest added to stake a historical and appears almost legendary as is the Attila (also known as The Scourge of God) on which little we really know, beyond which was the last leader of the Huns and probably the person most feared by the West, so that we can interact with him (whether to lead his people to victory or to defend his relentless attacks) awakens an attractive point of curiosity and freshness. As we said, this is a strategy game, albeit one with two distinct aspects: Campaign Map and Battles. The first one we'll see when we play it in campaign mode and our goal will be to decide, shift, every move on the world map (moving troops, attack, recruit units, manage resources, manage our cities, building and a long list of options), while in the Battles will be where we will resolve our conflicts by force in a style strategy game in real time, so be as important management phases such as military action. If you are regular in the series you will feel at home as playable level we are dealing with almost the same game as always, with all its many common options to consider how to keep a good economy at the same time we have pleased our citizens not rebel, deciding the marriages of our family, choosing rulers, ensuring that no political intrigues occur, etcetera. Likewise, the battles still maintain their usual style. They don’t have to gather resources, build buildings or anything like that. Our objective is solely to direct our troops in combat to rise up in victory. Here each "unit" consists of hundreds of soldiers who act for practical purposes as one, so although "only" have 10 units will see a battle of thousands of people in the battlefield, constantly transmitting the sensation of being in "total war", as indicated in the name of the saga. If you don’t want to crush us quickly, we must learn to choose the right for our troops, to leverage them to their abilities and advantages of each class, and use terrain to gain tactical advantage formations, since the position of our units will important (eg, a battalion hiding in the dense forest to make it invisible to enemy eyes so they can ambush). At first, especially if you are new to the series, probably all will seem a rather uncontrolled chaos, but as you begin to understand its mechanical will be surprised with how exciting it can get to be the battles of the game and the many possibilities that hide, offering some very satisfying moments that will make you to feel like real military strategists class. Among the novelties, one of the most striking and more we think has been the ability to turn our faction in a "horde" or a "nation". When we adopt the style of a horde, we will become nomads without settling on any fixed territory, so our style of play will be to move forward and looting everything we encounter us as we passed. But if we get tired of carrying this life, we can always find settle in an area with sufficient resources to expand our nation, at which time we will play by the same rules that we have always ruled in previous games. The interesting thing about this system is that it gives a lot of flexibility to the items, since there are few times that over the years in a campaign we are forced to change from one style to another, having to adapt our strategies by the way. In addition, not all cultures have this possibility, since, for example, the same Huns, being a nomadic people can not settle and always play as horde. Has also drawn much attention the importance of this issue has gained in climate, with very cruel and harsh winters that they will make it happen badly particularly in the later years of campaigns, and you'll have to give everything for a good management and your inhabitants and soldiers don’t die neither cold nor hunger. Nor can we forget to mention the important role of fire in both battles and the campaign map. Its uses in the first case are more or less obvious: burn a part of the map arson play in our favor. Few have seen most rewarding things in this saga set fire to a building and see how a few minutes it begins to spread throughout the city, which also helps provide a truly impressive sight with hundreds of troops battling while everything burns. However, be careful with this, you are not going to come back against you. Instead, the destruction that can be caused by fire also can apply to take certain strategic decisions at the stage of campaign, with some actually worked (and which capture perfectly the strategies of the time) possibilities. For example, imagine that you are about to lose a territory where you have a great city, because the enemy is about to launch an attack on you and not see how to defend yourselves what coming. For before losing troops struggling uselessly, why don’t burnest whole area while you escape to let your enemies without resources that can benefit and serve you pass as a smokescreen for the flight? The game modes are still the usual: Campaigns and Battles. The first ones can play either alone or with other players, either cooperatively or competitively. We will be playing pick a faction and try to fulfill the objectives that make us in "victory" over the years-long campaign. Each faction has a lot of quirks and unique features, so we recommend you try to start with one that suits your style of play. Moreover, Battles offers fast and direct to when we have no desire to walk managing nations or political or worrying long-term strategic action issues. Here you can participate in fully customized fighting, whether against bots (although they sometimes take a decision, at least, questionable) or other players, or also can decide to test our expertise in a number of real historical battles that the title we proposes to revive. Graphically we have a very powerful game that knows exploit the possibilities of your most top teams, offering a slightly more polished visuals and detailed than that of Rome II, with hundreds of units moving independently in huge maps and an effect very dynamic fire got. Textures are also very good and overall the game has a good optimization, giving us a lot of options that we adjust to the needs of our team. Yes, some visual bugs and other small bugs have left us with the feeling that they could have done a little more. In addition, the jump from the previous game is not particularly remarkable. The sound is also a section that we liked, with a soundtrack that captures very well the theme of the game and the time when it settles down, especially in battle. Moreover, the effects are the highest quality, are varied and they sound very forcefully. The negative side we have the Spanish dubbing, with a choice of interpretations and very irregular voices, mixing some well folded with others who sink the average counselors. 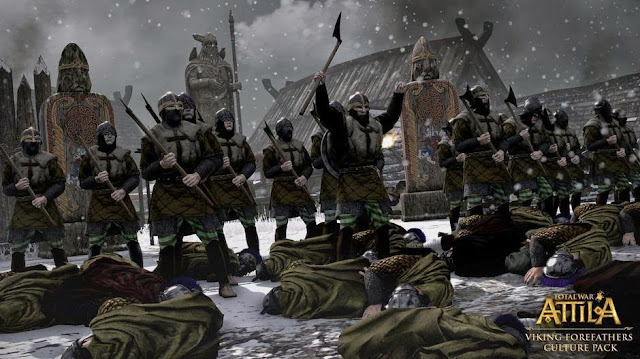 Total War: Attila offers just what its title promises: a gaming experience purely Total War set in one of the darkest times of humanity. The news is fair, but provides enough to make us feel with a new title, as many of the adjustments that have been made in their mechanical force us to change our mindset and develop different strategies to normal. The most important thing is that this is a very fun game playable with a huge depth, perfect to test our skills as a strategist in both the battlefield and in the political arena and diplomat, so we can not do otherwise than recommend you purchase a little that you like this genre so veteran.